The Thank You Card template pictured to the right is free below which can be used for any special church event, personal use, or any other event that you might need to thank the person(s) involved. The sincere beautiful quote on the front of the thank you card states "A lifetime is too short, And our warmest words too few, To thank those, Whose thoughtfulness, Brightens our days, And touches our hearts." and the inside of the card states "Hope you know, How warmly you're thought of, And how much you're appreciated, For all you do. - Thank You!" 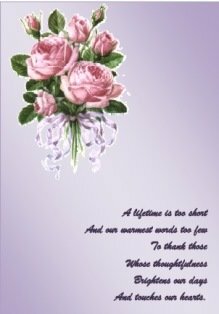 with beautiful graphics of flowers that will most certainly impress the special person(s) receiving this printable thank you card. Are you looking for just the right words to say "Thank You", Click Here for the Inspirational Bible Thank You Verses. Have you ever just wanted to let someone know how much you appreciated them? The printable thank you cards below can help you show them or thank them for what they have done for you. It is so hard to thank someone who has went out of their way to help you but there are proper ways to show this appreciation. To go out of your way to thank the person who went above and beyond for you is a way to make them feel just as special. It creates a satisfaction for the giver of an item or reaction that you are openly admitting that you personally appreciate their efforts and precious time. Put yourself in the shoes of the person who has done something special for you or has done something worth you giving them receiving thanks for before you send a card or something special. If you are thanking someone in an email then finish your emails with "Thank you for your time and attention" letting them know you genuinely appreciate the fact that somebody has taken the time to read your email and perhaps even honor a request or acknowledge some information. Tell the person who they did or what they gave you will make your life more fulfilling. Return to Donation Thank You Cards from Thank You Religious Cards.